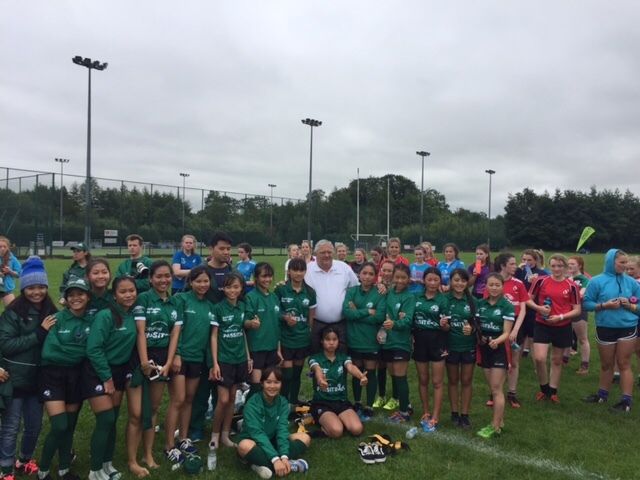 On the eve of the first semi-final of the Women’s Rugby World Cup 2017, participants from the ChildFund Pass it Back (CPIB) program traveled all the way from South East Asia to take part in games of tag rugby with local girls, and members of Peace Players Northern Ireland. The matches represented just one element in a day of sport, laughter and learning designed to bring communities from different parts of the world together, and to demonstrate why sport is such a powerful, universal tool for breaking down barriers. 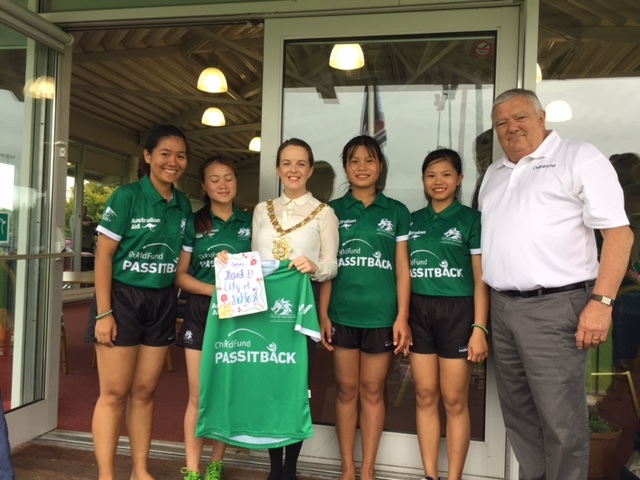 The young women from ChildFund Pass it Back traveled from rural communities in Laos, Vietnam and the Philippines to take part in the event, organised as part of of festivities around the Women’s Rugby World Cup, and to support World Rugby’s legacy programme, ‘IMPACT Beyond‘. 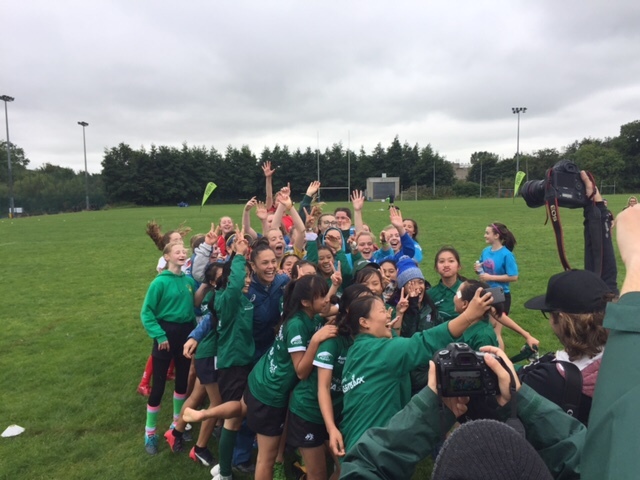 The event was attended by senior officials from the Irish Rugby Football Union, Michael Cunningham and IRFU Vice President Ian Mcilrath. ChildFund Pass It Back is supported by World Rugby, Asia Rugby and Women win. The Irish government supported the Belfast event as a demonstration of its commitment to international development work, and indeed the work of Irish Aid which supports many global development initiatives right across the planet, including programme’s run by ChildFund Ireland in Ethiopia, Mozambique and Uganda. The Lord Mayor of Belfast Nuala McAllister was on hand to lend her support for the event, giving graciously of her time to talk to girls from the programme and hear just what their visit to Belfast means to them. For all of the participants, it was their first ever time on an airplane, much less in another land far from home! The sheer energy and enthusiasm from all the participants on the day was clear to see. As an exercise in bringing communities together to learn about each others live’s through shared experiences, and understanding the importance of unity in combating exclusion and disadvantage, it made a powerful case for the universality of sports and indeed, why sport-for-development initiatives such as CPIB are such fantastic vehicles for breaking down social barriers. ChildFund Pass it back is a sport for development initiative that has been ruining in disadvantaged rural communities in Asia for five years. The programme introduces rugby to these communities, often for the first time. It encourages children to uptake the sport and to see the value of the game, as not just a fun, healthy, collegiate activity but also as a vehicle to develop important life skills that can assist the in their pathway to adulthood. One of the main goals of the programme is to encourage children to learn about leadership and to be assertive in their own communities as active role models for other children. This is of particular importance to girls and young women in the developing world, often marginalised, discriminated against, or victims of gender based violence and abuse. The programme represents a positive, life-arming vehicle for promoting children and respect for the rights of children in the community, while encouraging a passion for the great game of rugby.